Helping my son prepare for a fun, safe chukar hunt. My son, Josh, has accompanied me and our two yellow labs on several chukar partridge hunts over the past few years. I’m glad I allowed him to go on those trips as a spectator because chukar hunting is one of the most difficult hunts for youth. I don’t say this to discourage youth from chukar hunting; I say it to help them adequately prepare for a tough — yet very exciting — hunt. 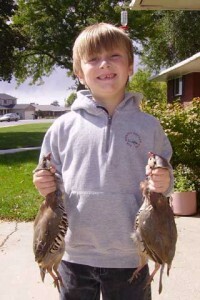 Here is a old photo of Josh, holding chukars that I harvested a few years ago. This year, he's excited about the chance to hunt and harvest his own birds. Josh turned 12 and completed hunter education this year. He now has a good idea of what to expect when he carries a shotgun on his first youth chukar hunt this Saturday (Sept. 17, 2011). 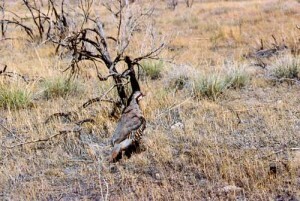 It’s an opportunity for youth to hunt chukars one week before the adults get to hunt. Despite his excitement, Josh is also a bit nervous. He struggles to comfortably carry and aim my 12-gauge shotgun at flushing birds, but fortunately, I have another shotgun that is not so heavy. He’ll be using that one on Saturday. This is an important aspect to consider: depending on the weight of the gun, some youth aren’t comfortable swinging and aiming at birds that are flying very quickly. A youth can comfortably take aim on a slowly approaching turkey while sitting in a blind. However, it takes more time and “clay pigeon” practice at the local shooting range to prepare for chukars. They can be out of shooting range within three seconds. Not only does a safe hunter need to be able to lift a shotgun and aim at a flushing game bird, but on a steep slope, a safe hunter must have sure footing, and also know what lies beyond the target. Because of their coloring, chukars can be difficult to spot in rocky, desert terrain. Josh’s biggest advantage is that he has two great dogs to let him know when chukars are close. Because Josh has hunted with me several times, he also recognizes our dogs’ behavior and when they are acting “birdy.” Having good bird dogs will give him an extra moment to prepare for the shot. 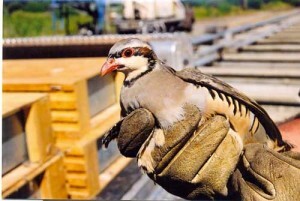 You can find chukars in many mountain ranges throughout the state. They prefer steep, rocky, semi-arid slopes. They spend time in rabbitbrush, sagebrush, saltbush and cheat grass below the juniper tree belt. The birds also prefer loose rock (talus) slopes that can conceal them and sometimes provide shade. The DWR will release hundreds of chukars in areas across the state before the youth hunt (Sept. 17) and the chukar opener (Sept. 24). When I’m hunting in the West Desert or other desert terrain, I like to drive slowly along the base of a mountain. It’s a good place to look for tracks crossing the dusty road. I also like to get out every so often and listen for birds in the different drainages and slopes. I love the chukar and grouse hunts because after the initial excitement of opening day (or the youth hunt, in Josh’s case), you can often have the mountain to yourself. I always like to have a cooler full of fun drinks and treats so that even if we don’t harvest birds, Josh has a good time and is comfortable. For the record, the chukar partridge is one of the best-tasting game birds in Utah. They actually do taste a lot like chicken! I live in Afton mn. and last year I spotted some ,what I thought were unusual birds running up and down the rows (25) 250′ of my raspberry farm I’m sure the first sighting was at the end of August. Upon further investigation I found out they were chukers and normally found in western states. There were 12 of them. We had a lot of snow last year every so often I would see only one. and then none Can you explain how I came to have chuckers in my neck of the woods? It sure was fun watching and listening to them I hope to see more of them this year.